One of the joys of being a guide in London is the constant discovery of interesting places to take my groups of regular walkers. Since 1996 I’ve been running Discovering London courses with my colleague Julian. Over a series of 30 weeks spread out between October and June we alternate between inside visits and guided walking tours. On these tours friendships are made and walkers return to us year after year so it can be quite a challenge to come up with new places to visit but we always manage to pull the rabbit out the hat each term with interesting visits that haven’t been arranged before. 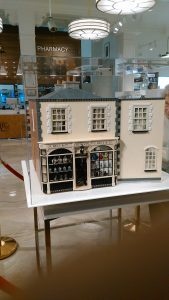 In November last year we took our groups to John Bell and Croyden in Wigmore Street. 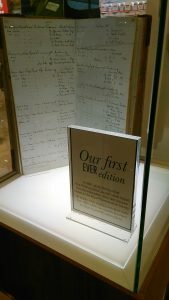 Established in 1798 by John Bell when pharmacy was in its infancy, the first shop was situated at 225 Oxford Street where Bell mixed up potions in the basement, keeping a journal of the customers he served and the preparations he made. In 1841 his son Jacob who eventually took over and expanded the business founded the Society of Apothecaries. Proximity to Harley Street provided a good supply of medical customers. Having merged with Croyden and Co founded by one of Bell’s former assistants, the chemist moved to its present Wigmore Street address in 1912. Although now part of a larger company, the shop retains its character and Manager Doug Creswell who showed us round was knowledgeable about the shop’s heritage. As we entered the first thing we noticed was a replica of the old Oxford Street shop. The model was made by Gerald Hector, son in law of George Percy Denton who worked there as a delivery boy in 1905. Gerald’s daughter Susan was given the model in 1995 and she set about furnishing it, commissioning furniture and dolls from specialist craftsmen. After her father’s death Susan loaned it to the shop where it has pride of place near the front door. When the shop was purchased by new American owners they decided to modernise the store to appeal to today’s up market customers. 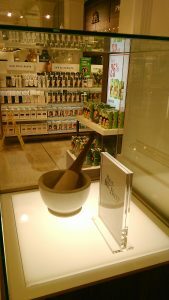 I was sad to see the old fixtures and fittings disappear but am pleased to say that the management are still proud of their long history so items such as this mortar and pestle for mixing pills are displayed in glass cabinets throughout the store. The shop has many famous clients including shopping guru Mary Portas, Madonna who owns a London house nearby, Sir Paul McCartney and Tina Turner. 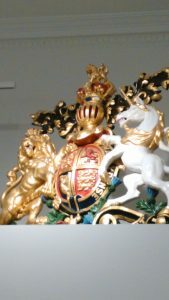 Members of Middle Eastern Royal families drop by when they are in town and the custom of our own Royal Family means that the shop can display the coveted Royal Warrant. 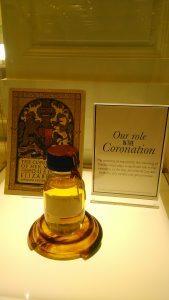 They provided the anointing oil for the Queen’s coronation which is also on display. You won’t find Her Majesty walking round the store though! John Bell’s staff will go to the Palace to deal with royal requests. Due to the upmarket nature of their clientele, the manager has to make sure that he always has the latest items on show. 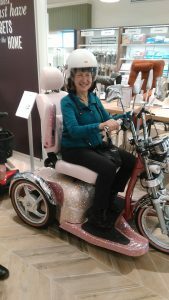 Whether it’s gym equipment or this pink “bling” mobility scooter, there’s always something to catch the eye. I tested it out with an eye to the future when I’m no longer fit enough to lead my tours on foot! To learn about my walking tours and “behind the scenes” visits email me diane@secretlondonwalkingtours.co.uk. You can either join the regular programme that I run with Julian or, if you can’t commit yourself to a weekly programme, sign up to my mailing list to receive details of “one off ” walks and visits. I look forward to seeing you on future tours! “Nothing to see here! Why don’t you take them somewhere interesting! ” yelled a local Eltham resident as he passed my tour group, cradling his can of Fosters at just gone 11.30am. 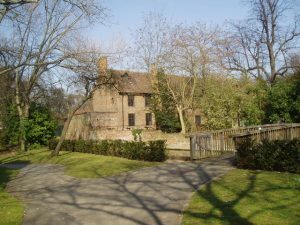 We were standing in Well Hall Pleasaunce, a delightful park opposite Eltham Station and no doubt our friendly local thought that the red brick Tudor Barn which stands in the park was no more than an ordinary pub/restaurant. In fact, this 16th century survivor was an outbuilding on the estate belonging to William Roper, husband of Margaret , the beloved daughter of Henry VIII’s Lord Chancellor Sir Thomas More. More would have been a regular visitor here before his sojourn in the Tower of London. Although well known as a children’s author, Edith had another less well publicised role as a founder member of the socialist Fabian Society. The Blands were an unconventional couple. After an unsuccessful business venture collapsed, Hubert relied on Edith’s writing to support the family. Her journalism, reviews and novels helped to maintain a household which included Hubert and Edith’s three children plus two children that Hubert fathered with his mistress Alice Hoatson. Alice joined the household as a governess. However, it would be a mistake to think of Edith as the hard done by and long suffering wife. She had her share of affairs, including a rumoured liaison with fellow Fabian Society member George Bernard Shaw. There are lovely descriptions of the tall and imposing chain smoking Edith holding court at Well Hall surrounded by eager young male admirers. She loved parlour games and musical evenings. Life at Well Hall was lively but not without its drawbacks. The house was rather dilapidated with constant structural problems including a collapsing staircase and gutters which overflowed causing flooding. Tragedy struck when Edith’s youngest son, Fabian, died at 15 from complications during a routine operation to remove adenoids. As the Blands aged, Hubert’s eyesight failed and Edith’s literary output was on the wane. This led to a period of financial hardship during which Edith and Alice could be found in Well Hall road selling flowers from a stall. When Hubert died in 1914 Edith remarried. This time her choice of husband was the rather less intellectual Tommy Tucker, marine engineer and Captain of the Woolwich Ferry. Some of their friends were aghast at the idea of Edith marrying below her class but she was happy although not prosperous. Edith and Tommy found Well Hall too expensive to maintain and moved to a more humble dwelling in Kent. Well Hall was demolised in the 1930s to make way for Well Hall Pleasaunce, On its site are wooden sculptures by artist Reece Ingram of three fantasy creatures from Nesbit’s book, surrounded by the public park that “Fosters Man” found so uninteresting. If he’d stayed to listen to the story of Edith would he have have changed his mind? When the temperatures in London soar I love to take my walkers down to the river. It’s cooler than the rest of London and you can discover parts of the Thames which are ignored by the crowds. Today, I met my group at Limehouse DLR station. Taking the Branch Road exit, we headed down to attractive Limehouse Marina. The marina is full of narrow boats and yachts used for living and leisure. 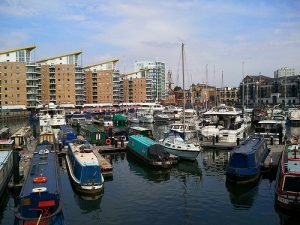 Walkways around the marina are surrounded by late 20th century residential buildings but in the 1820s when the marina was known as the Regents Canal Dock it was a very different scene. East Coast Colliers would dock here , transferring their loads to narrow boats and barges to transport coal to London’s gasworks via the newly opened Regents Canal and the 18th century Limehouse Cut, London’s oldest canal. Looking eastwards I pointed out the the tower of Nicholas Hawksmoor’s St Anne’s Limehouse, flying the White Ensign normally reserved for Royal Navy ships. A former Rector of St Anne’s described his churchyard as ” a sleeping world in miniature” referring to sailors from all over the world who were buried here. Limehouse was once London’s “Chinatown”. Chinese sailors and cooks from East India Company ships set up shops, laundries and restaurants in the area. When Journalist Arthur Ward from Birmingham, better known by his pen name of Sax Rohmer, wrote his first “Fu Manchu” story in 1912 Limehouse was full of Chinese lodging houses, clubs and restaurants. Most of the Chinese residents were respectable people but writers such as Rohmer, Dickens , Wilde and Conan Doyle painted a picture of a dangerous area filled with opium dens. Today’s journalists would describe late 19th and early 20th century Limehouse as “edgy” and this reputation attracted intrepid Londoners seeking adventure in the narrow, foggy streets leading down to the Thames. The physical structure of Limehouse was destroyed in the Blitz and the Chinese community moved on to Soho but today’s explorer can find traces of old Limehouse down by the river. I took my group through Ropemaker’s Fields, a new park created on the site of a Ropeyard visited by diarist Samuel Pepys in the 1660s. In Narrow Street we came upon a delightful terrace of early 18th century houses. An information board shows an artists impression of the 16th century Limekilns which gave the area its name. At the end of the terrace is one of London’s best riverside pubs, The Grapes. It is believed that Charles Dickens whose godfather lived nearby took his inspiration from The Grapes when he wrote about The Six Jolly Fellowship Porters in “Our Mutual Friend”. Dickens describes the “crazy wooden verandah impending over the water”. If you stop for a drink here you can sit by the crazy verandah and view the sweep of the river with the City skyline to the west, Canary Wharf to the east and Rotherhithe to the south. In the river stands one of Anthony Gormley’s self portrait statues, put there by one of the co owners of the pub. The identity of that co owner is no secret – one of our most distinguished actors, Sir Ian McKellen. You won’t find Sir Ian pulling the pints but you might spot him in the doorway of his house nearby. Finally, our group headed eastward towards the Canary Wharf estate, pausing to sit on a bench that doubles up as an art work called “Speaking of the River” by Constance De Jong. As your bottom hits the bench you’ll start to hear voices. You’re not imagining it! Speakers at the side of the bench transmit the reminiscences of former residents, recalling the effects of the Blitz and a day in the life of the West India Docks that occupied the site where the skyscrapers of Canary Wharf stand today. Hello and welcome to my blog. As a qualified London Blue Badge Tour Guide I spend my days showing Londoners and visitors the lesser known sites away from the tourist trail. In this regular blog I hope to introduce you to the stories behind some of the places we visit. If you'd like to join me on a tour then please sign up for my mailing list diane@secretlondonwalkingtours.co.uk to learn of forthcoming walking tours and inside visits. If you would prefer to get email notifications of new blogs on this website please go to the menu bar above to register. You can cancel at any time.